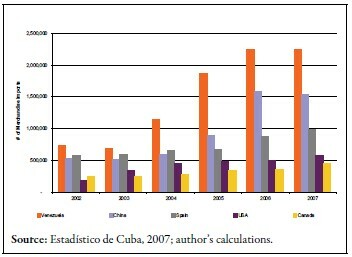 This paper evaluates the evolution of Cuba’s tourism sector from 2002–2007, and examines the relationship between tourism and the country’s merchandise imports for the same period. The analysis of Cuba’s tourism sector reveals its reliance on international trade, particularly merchandise goods required to meet the growing demands of foreign tourists and visitors. As Cuba struggles to ascend out of the economic crisis of the 1990s, its dependence on tourism revenue reveals the parallel impacts on the import sector. As a more thorough tourism infrastructure is created, the level and types of imports have risen or stagnated accordingly. This paper analyzes trends and identifies emerging patterns in comparing tourism statistics between 2002 and 2007 to import statistics for the same time period. Cuba’s tourism sector has been the country’s top export industry since 1994. Tourism represents approximately 12% of Gross Domestic Product (GDP), while the services sector, which includes tourism, is equal to about 67% of GDP (CIA World Factbook, 2009). Tourism also holds a place of importance in the overall share of export earnings. Since 2002, gross tourism receipts have risen steadily, at an average growth rate of 27%, surpassing tobacco, nickel and sugar (Federation of International Trade Associations [FITA], 2008). The trade sector is also listed as one of the top three economic sectors for employment, hovering at approximately 600,000 workers from 2002–2007 (Anuario Estadistico de Cuba, 2007). Cuban tourism infrastructure is run by the Ministry of Tourism (MINTUR). MINTUR is “the state body ruling the tourism system, in which other entities of the country also participate” including but not limited to: Hoteles Cubanacán S.A., the main tourism group in the area of 4 and 5 star hotels; Gaviota with its emphasis on marketing tourist activities; Cubatur, the primary travel agency and Caracol, which manages the souvenir shops across the country (Cuba Travel USA, 2008). The number of international visitors, overnight stays, available rooms, and gross revenue from tourism rose steadily between 2002 and 2005, followed by a slight decline in 2006 and 2007 (see Table 1). One of the main factors for this decline was the restrictions imposed on travel to Cuba by the Bush Administration. “In March 2003, the Administration eliminated travel for people-to-people educational exchanges unrelated to academic coursework. In June 2004, the Bush Administration further restricted family and educational travel, [and] eliminated the category of fully-hosted travel” (Congressional Research Service, 2009). 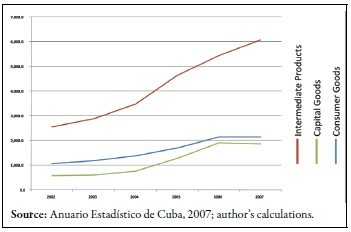 Cuba’s “de-dollarization program” has also been a contributing factor (González-Corzo, 2006). In 2004, Cuba implemented a series of monetary policy changes, which ultimately resulted in the replacement of the U.S. dollar with the convertible peso (CUC) in all hard currency retail establishments. These changes formed part of the country’s “de-dollarization program” which “required all entities that had previously accepted U.S. dollars to only accept convertible pesos” (González-Corzo, 2006). In addition to a 10% service charge, this policy made travel to Cuba more expensive than to other Caribbean countries, effectively lowering number of international tourists, length of stay, occupancy rate and gross revenue. International visitors, which includes tourists (more than 24 hours) and excursionists (less than 24 hours), fell by 98,767 visitors in 2006 and another 68,346 visitors in 2007 (see Figure 1a). This was a reaction to the restrictions on travel from the U.S. for Cuban Americans visiting family members in Cuba. Overnight stays, which shows an average length of stay per international visitor to be 7.2 days, is also subject to the U.S. embargo on travel, falling 300,251 between 2005 and 2007. 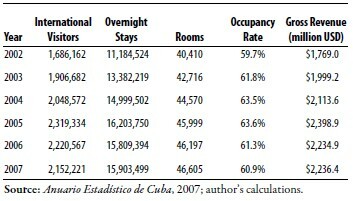 In 2002, overnight stays per international visitor were 6.6, rising to 7.3 nights in 2004. The occupancy rate shows a lower average decline due to the variance in number of rooms available for use. It does not count the total numbers of rooms in the tourist installations, but rather only the ones available for bookings. If an installation is under construction one year, and then available for tourist bookings the next, the net between the decline in tourists stays and the rise in the number of rooms available would create this variance. It is not clear whether the slower rate of decline is due to infrastructure problems or actual tourism statistics. Gross tourism revenues include receipts from international tourism and transportation (see Figure 1b). 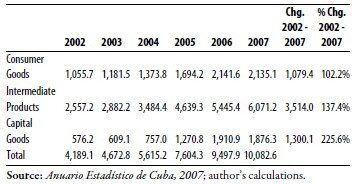 Explaining the decline in 2006 and 2007, U.S. travel restrictions would also reduce transportation fees such as airport landing fees and cruise ship docking fees which contribute towards tourism’s share of Table 2 shows that the top five countries sending visitors to Cuba are Canada, England, Italy, Spain and Germany. The “sun and sand tourism” effect, along with cultural differences, help explain why these countries are the primary sources of international visitors to Cuba. Unlike Cuba, the climates of their countries are subject to seasonal alterations making year round access to beaches uncomfortable. In addition, Cuba’s relative isolation makes it a cultural anomaly among the Caribbean countries, retaining much of its individuality apart from the more mainstream Caribbean islands. For all European countries and much of Canada, Cuba is the closest Caribbean island, minimizing flight length and maximizing the vacation time. The factors, combined with the fact that these countries (e.g., Canada, the UK, Italy, Spain, and Germany) are among the most developed (and wealthy) countries in the world, explain why they outrank countries that are geographically closer to Cuba as the island’s primary sources of visitors. Interestingly, cubatravelusa.com also lists these five countries as part of the 10 “regions prioritized for tourism development” by Cuban marketing efforts (Cuba Travel USA, 2008). Canada is Cuba’s largest supplier of tourists. 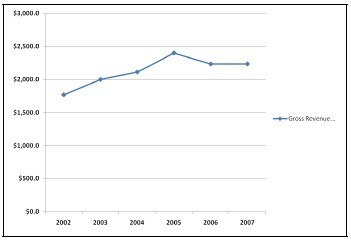 However, infrastructure problems such as “lack of adequate service for tourists, theft of luggage at airports and hotels, and a failure to attend to complaints” has contributed towards a slowing growth rate since 2002, from 29% in 2003 to 0.3% in 2006, although 2007 has seen a 9% increase in number of tourists (USA Today, 2007). Merchandise imports of consumer, intermediate and capital goods have risen steadily between 2002 and 2007, with imports surpassing exports in all years during this period. Analyzing only merchandise imports, Cuba shows a huge trade deficit (see Table 3), and while including the services sector reduces the trade deficit, it does not eliminate the negative balance. With the disintegration of the Soviet Union in the early 1990s, Cuba’s external sector suffered due to the elimination of subsidies and preferential trade agreements. The country has since negotiated similar contracts with Venezuela and China. During the economic downturn of the Special Period, Cuba focused its limited import capacity on food and fuel, allowing concerns for future economic expansion to be put aside in terms of capital imports. Cuba’s capacity to import can be measured by analyzing its merchandise (import) subcategories of consumer goods, capital goods and intermediate goods. Consumer goods include items such as food and clothing or a good that satisfies human needs through direct consumption. Machinery or other items used in production of commodities are considered capital goods; finally, intermediate goods (or producer goods), such as raw materials or fuels, are goods that are generally used as inputs in the production of other (tangible) goods. In 2002, consumer goods accounted for 25% of merchandise imports, intermediate goods were 61%, and capital goods were 14% (see Table 4 and Figure 2). In 2007, consumer goods accounted for 21% of merchandise imports, while showing a growth of 102% in the amount of goods imported. Intermediate goods remained the largest component of merchandise imports at 60% with a growth rate of 137%. Finally, capital goods rose to 18% of the total, while showing the greatest growth rate at 225%. Between 2002 and 2003, imports of consumer goods increased 16.2%; the rate of growth of imports of consumer goods rose to 23.3% during the 2003–2004 period, and to 26.4% between 2005 and 2006. This sudden rise in imports of consumer goods reflected the notable influx of of foreign funds due to financing from China and trade agreements with Venezuela. Alternately, following the series of natural disasters including a drought between 2003–2005 and two hurricanes in 2004 and 2005, food reserves were built up, limiting the necessity to import consumer goods in 2007 (Korves, 2007). This stagnation can be seen in Figure 2 as the growth rate between 2006 and 2007 actually decreases slightly. The substantial rise in imports of intermediate goods is due to the ever increasing price of such imports and the need to allocate a large portion of Cuba’s import bill towards purchases of fuel and other raw materials. The top three countries importing into Cuba are Venezuela, Spain and China (see Figure 3). In the last few years, China has become heavily involved in extending credit and financing to Cuba for the purpose of importing Chinese goods (Pérez-López, 2008). The main imports from China are household electronics and machinery, most notably the imports of buses. In accordance with the Sino-Cuba trade agreement, Cuba has agreed to import 5,348 buses between 2007 and 2009 (BNET, 2007). In addition the two countries are economically complementary. China’s main imports from Cuba are raw sugar and medicine, while exporting rice, kidney beans, and mechanical and electronic products (China View, 2004). Venezuela has assumed the role of benefactor (and supporter) formerly held by the Soviet Union. Heavily subsidized and advantageous trade agreements, initially signed in 2000 have led to Venezuela establishing a presence in Cuba with its investment in the Cienfuegos oil refinery (Reuters, 2008). Reuters reports that as of March 5, 2008, the upgrade on the refinery was progressing as planned and should be in full operation by 2013. The article also claims that Cuba will be used as a base by Venezuela to distribute oil throughout the Caribbean. In addition, establishment of a branch in Cuba of the Venezuelan oil company PDVSA named PDVSA-Cuba, which will serve as a base of operations for the two firms in the Caribbean helps to cement Venezuela as one of Cuba’s leading trading partner both for imports and exports (Bilaterals, 2005). It is apparent from Figure 3 that imports and exports with China and Venezuela rose accordingly with the developing relationships. While China and Venezuela have engaged in preferential trading, Spain has partnered with Cuba to export much of its industrial goods. Spain also has a significant investment in Cuban tourism infrastructure and in 2000 it entered into an agreement with Cuba to explore opportunities related to development of oil and gas in Cuban waters in the Gulf of Mexico (Baklanoff, 2001). In addition, the large amount of imports from Spain may be explained because of “kinship affinities” and a “latent anti-Americanism” (Baklanoff, 2001). Figure 3 also illustrates that the United States places fourth out of Cuba’s top five trading countries. The U.S. imports are mainly commodities such as agricultural goods. The trade agreement between the two countries is on a cash only basis, but is convenient to both entities because of low transportation costs due to proximity. 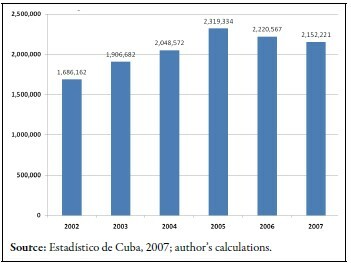 There is an ongoing argument that lifting the travel ban would allow the US to export more commodities in order to feed tourists, however other sources claim that “eliminating financing restrictions” would increase exports to the country in terms of bulk commodities sold to Cubans, instead of tourists (Korves, 2007). According to the Economist, (2008), most food imports are distributed via a subsidized rationing system with demand exceeding supply. The growing trend in the tourism industry as an emerging and evolving sector reveals the importance of analyzing similar trends in the import sector. Tracking growth and changes will help determine basic import needs as the tourism infrastructure is rebuilt and refined. In addition, Cuba now has different relationships with its trading partners and must adjust accordingly as the demands of the country’s consumers and citizens continue to rise. 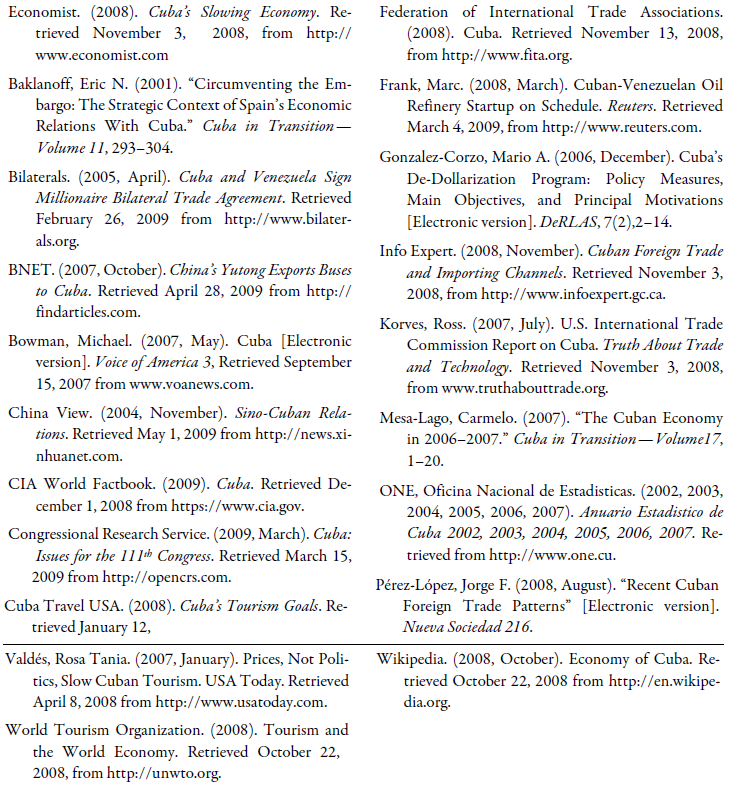 Research for the analysis includes internet resources, Cuban statistics, and academic papers. The linear regression applied includes tourism indicators from 2002–2007 and merchandise imports for the same period. 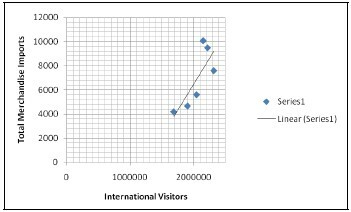 In addition, scatter plots further display the relationship between tourism and select economic indicators. The independent variables are tourism statistics, which include international visitors, overnight stays, rooms, occupancy rate and gross revenue (see Table 5). The dependent variable is merchandise imports for the time span being studied. Both set of numbers were obtained from Anuario Estadistico de Cuba (AEC) in 2008. Using these variables allows an analysis of the two intertwined sectors in an attempt to prove a positive relationship between the two sets of data. Out of the four independent variables included in the analysis, only two were statistically significant. These were International Visitors and Rooms. 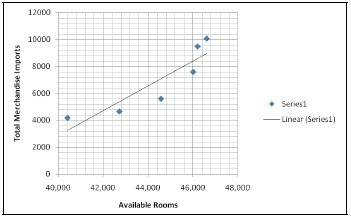 Further analysis shown by the scatter plots below (Figures 4 and 5) indicate a stronger relationship between the growth rate in number of rooms available and the rise in merchandise imports than between the number of international tourist and the import sector. When analyzing number of visitors with total merchandise imports, that scatter plot shows that imports continue to rise despite the decline in number of visitors, indicating an independence from each other. However, in the second analysis, below, total merchandise imports rises accordingly with the number of available rooms, indicating a greater need for imports as the tourism infrastructure expands. The relationship between the two variables is positive, yet more conclusive is the fact that the rise in imports is more likely to be determined by the increasing cost of supporting a tourist infrastructure rather than supplying the tourists on a point of purchase basis. Cuba is making an effort to maintain a steady rate of growth in its emerging tourism sector. As an engine of the economy, tourism generates a large share of GDP and the growth trend continues upwards. However, with the rising costs of fuel and commodities, the cost of supporting this developing sector is also increasing. The expected results of the research were to find that Cuba’s import sector strongly reflected the increasing rise in international visitors. However, the actual results showed a greater dependence on creation and maintenance of tourist installations. 1. Editor’s Note: This essay was awarded Second Prize in the ASCE 2009 Student Prize Competition for undergraduate students.